Buy the Taken films cheaply from Amazon. You too can earn money from writing articles by signing up for InfoBarrel. Taken 3 opens with a group who look like they belong to the Russian mafiya, led by Oleg Malankov (Sam Spruell, Snow White and the Huntsman), taking a man from his home to the office where he works. The man's boss apparently owes Malankov a lot of money, and he wants it back, with nothing said as to what relevance that has to the story. Bryan Mills (Liam Neeson) is visiting his daughter, Kim (Maggie Grace, Lockout), for her birthday again and, although he doesn't know it at this point, it looks like he is about to become a grandfather. His ex-wife, Lenore (Famke Janssen, Hansel & Gretel: Witch Hunters) visits Bryan at his apartment. Her marriage to her husband, Stuart (Dougray Scott) - who is played by a completely different actor than he was in the original Taken - is falling apart, and it's looking like she and Bryan may end up back together if it does. Credit: http://en.wikipedia.org/wiki/Taken_3#mediaviewer/File:Taken_3_poster.jpgThings quickly fall apart when Bryan finds Lenore murdered in his apartment, and the police turn up having been tipped off. Not the sort to go along quietly, Bryan escapes the police so that he can find out himself what happened to Lenore. He know that he didn't kill her, but he wants to find out who did. One of the same men who was seen at the beginning of the film was watching Bryan's apartment when he found the body of his ex-wife. The police, led by Inspector Franck Dotzler (Forest Whitaker, The Last Stand), have a different idea, as Bryan is the prime suspect in his ex-wife's murder, and most of them consider him to be rather more than a suspect. The pursuit of him results in quite a bit of mayhem, even if there is no actual real injury done to any of the police officers. The true violence is reserved for the Russians, and there, once again, Bryan gets to demonstrate his "very particular set of skills." What looks to be the twist is rather obvious and can be figured out quite easily early on, even though it is not revealed until later. This is, however, not the actual twist. Lenore's husband, Stuart, has a more significant role in this film and, as well as the actor changing, his character seems to have changed a bit too. There are some nods to the first film, with it being Bryan Mills saying "Good luck" on the phone this time, and a later reference to the monologue that had preceded that statement, abbreviated somewhat. Some other good lines, such as when a police officer tells Bryan "This is going to end bad for you" and he replies "Don't be such a pessimist." Forest Whitaker's character seems rather underutilised. There appears to be some sort of back-story there - he appears smart and good at his job, even if he isn't that well liked it seems by his subordinates, but nothing is developed about this. Why does he carry a chess piece - a knight - around all the time? He is also always playing catch up, even though the impression is given that he is better than that. Either something has been cut from the film regarding his character, or he was never developed properly. Either way, it's a bit of a jarring note, as the impression is given that he should have been more important. There is a plot to the film, with the bad guys being played by the Russians this time, not the Albanians, even though an impression was given at the end of Taken 2 that the Albanians might be back for more, as Mills had killed yet more of them, which was the reason they were after him in the second film, as revenge for everyone he had killed in the first (they objected others killing them, but were perfectly happy with the other way around). Perhaps they are planning another film in the series. The violence, and there is quite a bit of it, is all rather bloodless, even when it involves guns, and Bryan seems to be slowing down a bit. Or perhaps his opponents are, this time, rather more competent at violence themselves, which is a possibility. At least the overall pattern of the film was different this time - both Taken and Taken 2 proceeded along very similar lines, even if the characters and events changed. 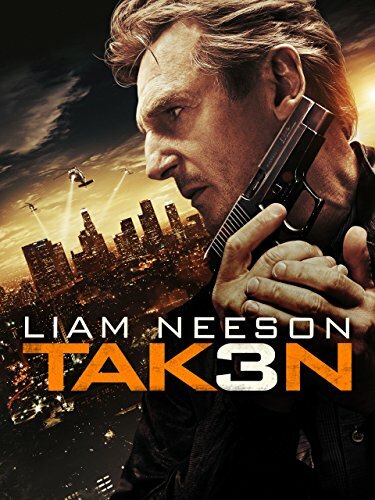 Taken is still the best film in the series, but Taken 3 is still an enjoyable film with Liam Neeson again showing that you can become an action star later on in your career. This just reminded me that I haven't watched Taken 2, but with Whitaker in 3, it is also a must watch. I did feel he should have been used better though. I have seen the first 2 Takens, and I am really excited to watch Taken 3. Thanks for the review. I think Liam Neeson makes a surprisingly convincing action star in these.